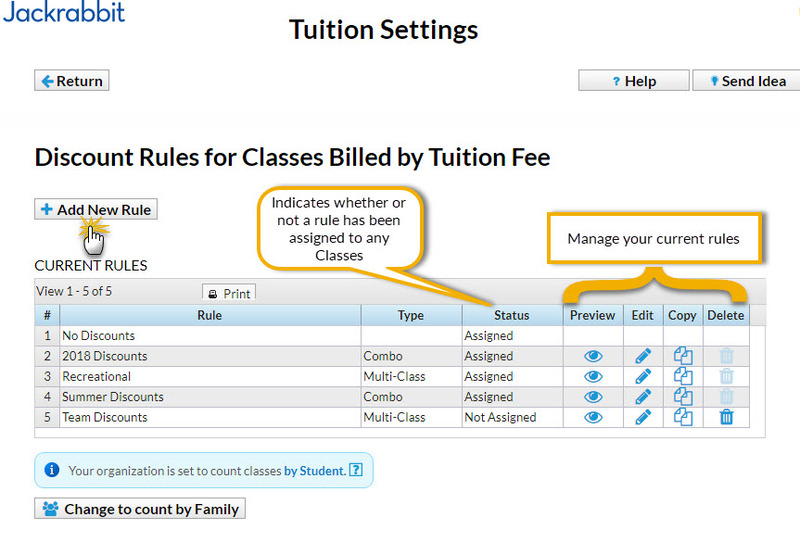 Discount Rules are created in Tuition Settings from the Tools menu > Edit Settings. Click the Manage Rules button to open the rule builder. Click the Add New Rule button to start building a Discount Rule. If you don't see the Manage Your Discount Rules option in your Tuition Settings it may be that your database is currently only set to use the By Total Hours Billing Method. Discount Rules are only available when you bill your classes By Class Fee. Name your rule and determine what kind of rule it is: Multi-Class, Multi-Student, or a combination of both discount types. Note: A class can only accept one rule at a time, so if you wish to apply both Multi-Class AND Multi-Student discounts you will use a combination rule. How should the multi-class discounts be applied? Select Use the discount rate listed for each class if you'd like Jackrabbit to use the discount listed for each class. Select Add up classes and use the discount rate listed for the total # of classes if you'd like Jackrabbit to add up the classes and use the discount associated with the total. The 1st class for each student is not discounted, the 2nd class for Dave is discounted 5%, and the 3rd class for Dave is discounted 10%. Total tuition posted is $385. Dani has only one class so she receives no discount, Dave is in a total of 3 classes and each of those classes is discounted 10%. Total tuition posted is $370. The discount can be a dollar amount or a percentage to be applied to the tuition fee(s). Define what discounts will be applied to classes one through six. The 7th class and beyond will use the discount defined for Class 6. In what order would you like to apply the discount? Highest tuition gets lowest discount (most common) - Jackrabbit will order the classes with the highest priced class considered as Class 1. The lowest discount is applied to highest priced class. Lowest tuition gets lowest discount - Jackrabbit will order the classes with the lowest priced class considered as Class 1. The lowest discount is applied to the lowest priced class. How should the multi-student discounts be applied? Select Use the discount rate listed for each student if you'd like Jackrabbit to apply the discount listed for each student. Select Add up the students in the family and use the discount rate listed for the total if you'd like Jackrabbit to add up the students and use the discount associated with the total. Student 1 uses the discount listed in Student 1 (0%) and their classes are not discounted, Student 2's classes use the discount listed in Student 2 (5%), Student 3's classes use the discount listed in Student 3 (10%) and Student 4's classes use the discount listed in Student 4 (15%). The 4 students in the family are added up and the discount rate for Student 4 (15%) is applied to all students' classes. Define what discounts will be applied to students one through six. The 7th student and beyond will use the discount defined for Student 6. You may opt to give the discount listed for Student 1 to families with only 1 student. Highest tuition gets lowest discount (most common) - Jackrabbit will order the students with the student having the highest priced tuition considered as Student 1. The lowest discount is applied to the student with the highest tuition. Lowest tuition gets lowest discount - Jackrabbit will order the students with the student having the lowest priced tuition considered as Student 1. The lowest discount is applied to the student with the highest tuition. Select Give both discounts (multi-class and multi-student) when applicable if you'd like Jackrabbit to give both discounts whenever applicable. Select Give only multi-class discounts; only give multi-student discounts when multi-class doesn't apply if you'd like Jackrabbit to first check for multi-class and apply if applicable. If no multi-class are applicable, Jackrabbit will apply multi-student if applicable. See above (Multi-Class Type Discount Rule and Multi-Student Type Discount Rule). Click the Preview Rule button to see the discount you are building in action! Enter a Tuition Fee to see an illustration based on the rule's discounts and the fee you entered. Note: Because the same fee amount is used for each class tuition, the highest/lowest settings are not reflected in the tuition fees discounting example. When you are happy with the results of the rule you are creating click Save Changes and you will be returned to the main page of the Discount Rule builder. Now that you have created your Discount Rule(s) you will need to assign it to your classes. 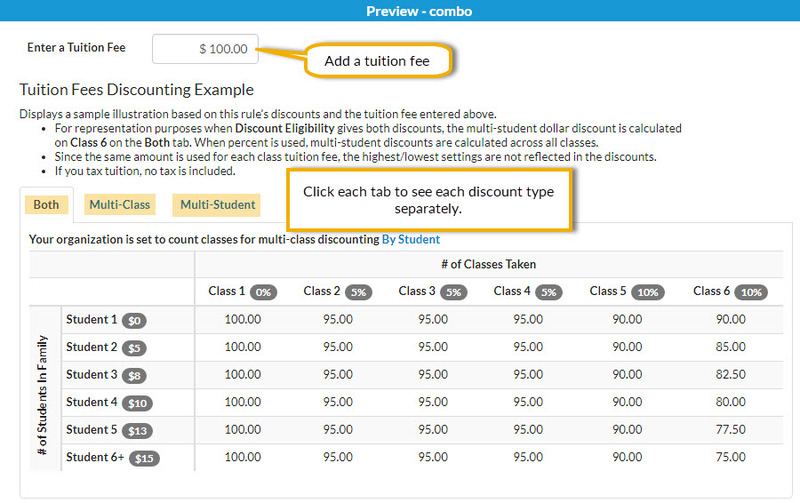 See Assign Tuition Discount Rules to Classes.